Eye On Sports Media: Phil Mickelson Signs New Endorsement Deal...So What? Phil Mickelson Signs New Endorsement Deal...So What? Athens, GA (Feb 8, 2008) - Making the rounds on media and press release sites yesterday was the news that Phil Mickelson had changed major sponsors from Bearing Point to KPMG. Unable to make the sports news with his play lately, this is how he is making headlines. Unfortunately, there is no real news here because there is not, in reality, any change being made here. "We're both proud and excited about our new relationship with Phil Mickelson. We share the same passion to be the best, and an unwavering commitment to professionalism in our chosen fields," said Timothy P. Flynn, Chairman and CEO of KPMG LLP. "Golf is a sport that has a worldwide following. 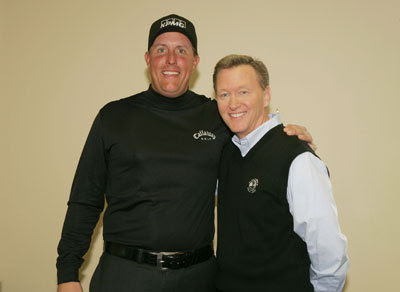 Teaming with Phil -- one of the world's top and most admired players -- will bring the KPMG name additional positive recognition around the globe." "I'm equally proud to join with KPMG," said Mickelson. "After talking to its leadership, I came away convinced that KPMG is passionately focused on 'being the best,' through building a culture based on professionalism and integrity. It's that culture and the shared passion to be the best that drew me to this relationship. I'll be bringing everything that I can to our relationship, both on and off the golf course. I want to be sure that KPMG, its partners, its professionals and its clients enjoy the full benefit of our relationship." The only problem is that this is not really a "new relationship" between Mickelson and KPMG. The reality is that he has had KPMG as his major sponsor for years. It started with KPMG consulting, which was part of the bigger KPMG firm until the Securities and Exchange Commission (SEC) and AICPA issued rules that forced them to spin the consulting practice off so that "audit independence" could be maintained. The name of the company was changed to Bearing Point, which Mickelson has been wearing on his visor for a number of years now. And now, he is switching back to a KPMG visor. The real question is why he is switching from Bearing Point. Is it because of the financial difficulties and the problems they have had with the SEC over the past 4+ years? Did he decide he wanted to sever his name from these problems? Or did Bearing Point decide the cost to remain his major sponsor far outweighed the benefits received? These are the questions EOSM wishes the media would be asking. That way, it can be said in Paul Harvey style: "Now you know the REST of the story." Gotta hand it to the KPMG PR dep't. It must be tough to get positive ink over a non deal / cover up like this. Phil left BearingPoint because the company failed to renegotiate a contract with him. A deal was in place in December, but the former CEO was dismissed in December, and the new CEO failed to ratify the contract. That's why Phil is suing.